There are lots of holiday parties going on these days and at work we had our annual potluck on Friday. I made meatballs in sauce last year - a good choice and well-received, but I wanted to do something very different this year. 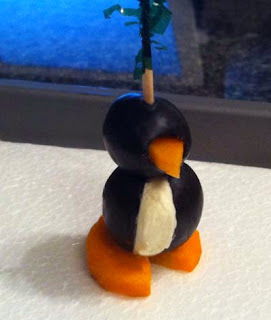 A couple of months ago I saw a picture online, can't remember where, of Penguin hors d'oeuvres that were so cute that they stuck in mind. They looked easy to make so I got the ingredients: a fairly large carrot, a tin of large black olives, a tin of medium black olives, cream cheese and toothpicks. I made penguins! They turned out well, in my opinion, and it's a good thing. I didn't have a Plan B and it was too cold to run out to the grocery store for something else. 1. Clean the outside of a large carrot. I used a potato peeler to do the job. Then, slice the carrot into thin slices for the feet. 2. Cut and remove a little triangle from the carrot slice and save this piece for the beak. 3. Drain the cans of olives and lay out on a paper towel to soak up any excess moisture. I found that one can of each size was all I needed. 4. Make a slice down on one side of a large olive, then fill the olive with room temperature (for easy spreading) cream cheese, any flavor you like. I used plain but I might try a flavor next time. Either is good. 5. Insert the 'beak' into the large hole in the medium olive. 6. I found toothpicks with a bit of festive cellophane on the top. Put the toothpick through the medium olive (head), down through the large olive (body), then through the carrot (feet), letting the toothpick go all the way through and sticking out a little bit...about 1/8" inch is plenty. 7. Using a wet paper towel clean off any excess cream cheese from the body. For me, this was the slowest part as the cream cheese is rather sticky and wants to spread instead of coming off. It got easier and quicker as I went along. I made penguin after penguin after penguin, ending up with more than 3 dozen. Next...how was I going to display them and be able to carry them to work? A friend and I talked it over and came up with a number of ideas, finally settling on one that worked out very well. At Michael's I bought a sheet of 1/2" thick styrofoam and cut it to snuggly fit inside a cookie sheet. I didn't have anything to properly cut the styrofoam so I used scissors. It didn't make for the smoothest of an edge, but it was okay. I rounded the corners, too, to make a good fit. Before I placed the styrofoam on the cookie sheet I covered it with plastic wrap, taping it on the underside so that it would stay put and tightly-covered. This served two purposes. Any possible bits of fly away styrofoam would be contained, and it made the surface shiny like ice. I arranged the penguins in a single file, each following the other. 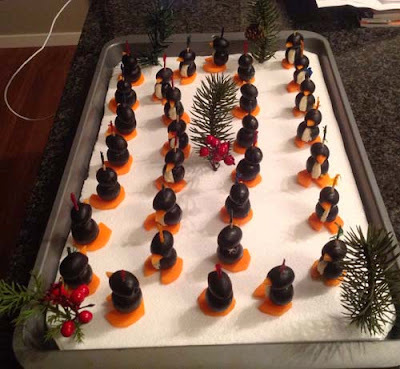 The penguins were anchored on the sheet by the little bit of toothpick that stuck out on the bottom of the feet. I didn't want them to fall out of line or fall over when I carried them to work. At Michael's I also picked up a bit of greenery and berries and stuck this in the 'ice' to give a festive touch. What you don't see here is the little sign that made and put in the middle: "March of the Penguins". I made the sign from a blank business card, folded in half lengthwise. They were delicious and everyone seemed to like them. As a matter of fact, quite a few people took out their cell phones and snapped pictures. The penguins had paparrazi! Some even took a penguin home to show their family. It was a very rewarding, and an easy appetizer to make. Now, what will I make next year? I'd like to come up with something new and just as interesting. I've got a year to think about it. Suggestions welcome!